The STANDARD Clip Art Set for the Phoenix features 40 illustrations of the Phoenix doing school related activities. These images are great for yearbook design, bulletins, worksheets, newsletters, Web sites and all types of school communications. You get both high resolution (vector) and low resolution (png) versions of each clip art image. Behavior Clip Art Sets feature illustrations designed around specific words commonly used in PBIS themes, or acronyms, such as respect, responsibility, safety, kindness, citizenship, leadership, integrity, anti-bullying and others. The Phoenix Behavior Clipart set features 40 illustrations of the Phoenix mascot demonstrating positive behaviors such as respect, responsibility, diversity, anti-bullying and more. Get your FREE version of the Phoenix Gotcha Reward by clicking here. 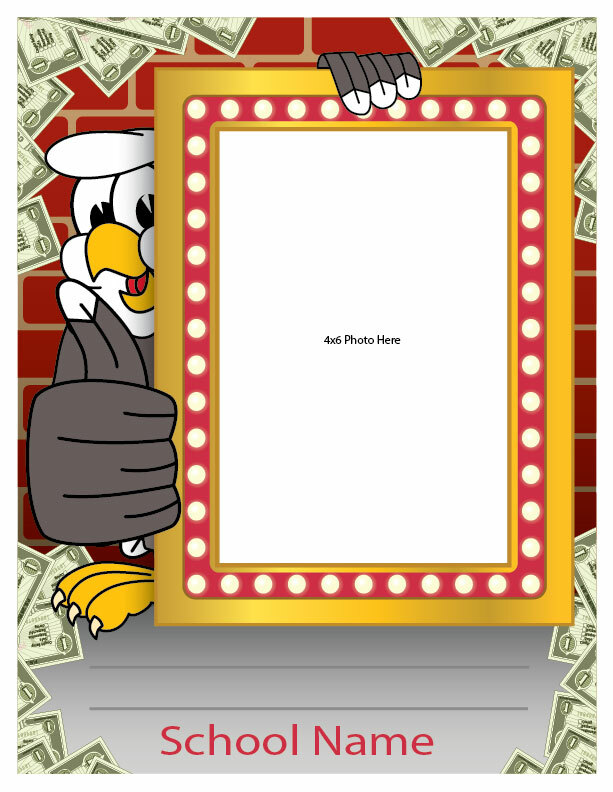 Use 45 Award Certificate templates (Powerpoint) to reward students for everything from honor roll, to perfect attendance, demonstrating respect and a wide array of positive behaviors. Click the image to learn more, or see our catalog. The student spotlight frames are made to recognize student achievements throughout the school for all to see. Simply write in the student name and add an image. They are completely customized with your mascot, school name and any other information you want. Receive the digital files to print your own at 8.5"x11". Or order durable laminated plastic (styrene) posters from us at 24"x 36" and place an 8.5"x11" image. This PBIS poster welcomes students and tells them what it's like to be part of the Phoenix community. Meet your student testing (PBIS survey) requirements with greater ease by using a pledge to make your PBIS theme easier to remember. Use our matrix template to get started with your PBIS program. Click the matrix (below) to download the editable word document. Customize it with your own expectations, then send it back to us, and we'll bring it to life with engaging illustrations of your mascot visual demonstrating the behaviors. 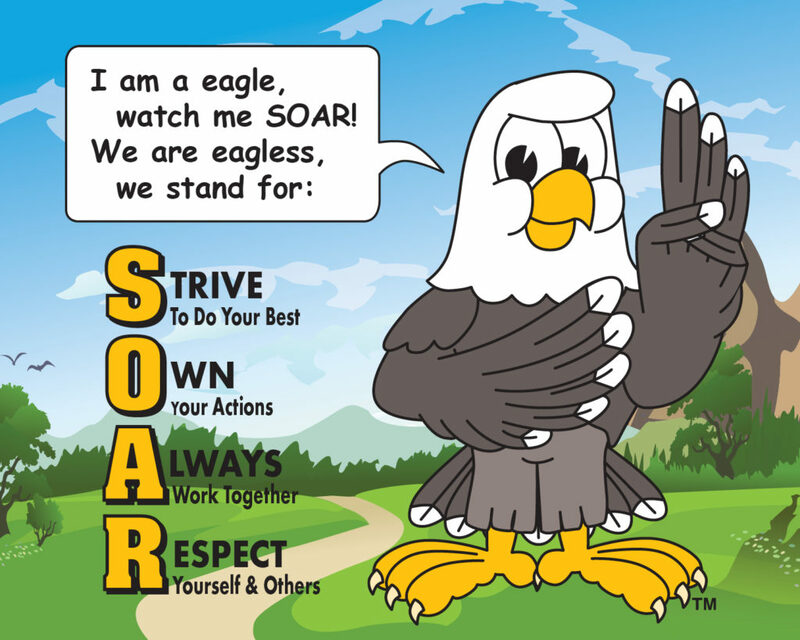 Download an editable Word doc version of this SOAR Matrix. It is a great place to start developing a positive behavior or character trait education program. Feel free to edit and make changes, then let us bring it to life for you in beautiful color, and featuring illustrations of your mascot. Use this restroom rules poster to teach students how to be respectful, responsible and safe when using the bathroom. Make the playground a fun and safe place for students. Use this PBIS rules poster to remind students how to be safe, respectful and responsible while playing on the playground. Reinforce safety in the school pick-up and drop-off area by posting this PBIS rules poster where students and drivers can see it. Keep students informed of rules related to safety, respect and responsibility while in the library with this PBIS poster. Use this hallway rules poster to teach students how to be safe, show respect and demonstrate responsibility whenever they are in the hallways. Meet PBIS requirements by posting these PBIS rules Posters in 8 of 10 areas throughout your school. Post this classroom rules poster in each classroom to teach student how to be safe, and demonstrate respect and responsibility in the classroom. Post this cafeteria rules poster in your school cafeteria to teach students behavioral expectations related to safety, respect and responsibility. Use this PBIS Posters to teach students bus safety and behavioral expectations. 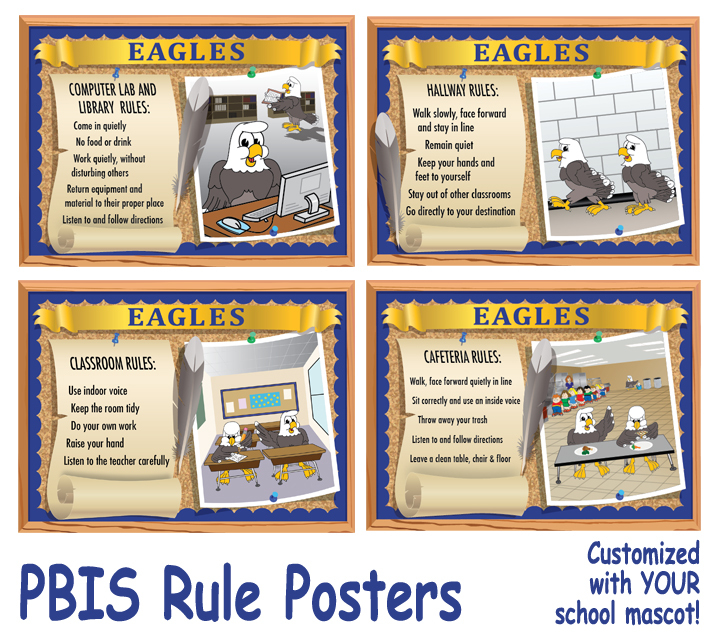 Use this PBIS rules poster for school assemblies to teach students proper behavior during a school assembly. Use these Be posters to reinforce your PBIS theme. Each one targets a specific behavioral expectation or character trait, and features your mascot visually demonstrating what it looks like. 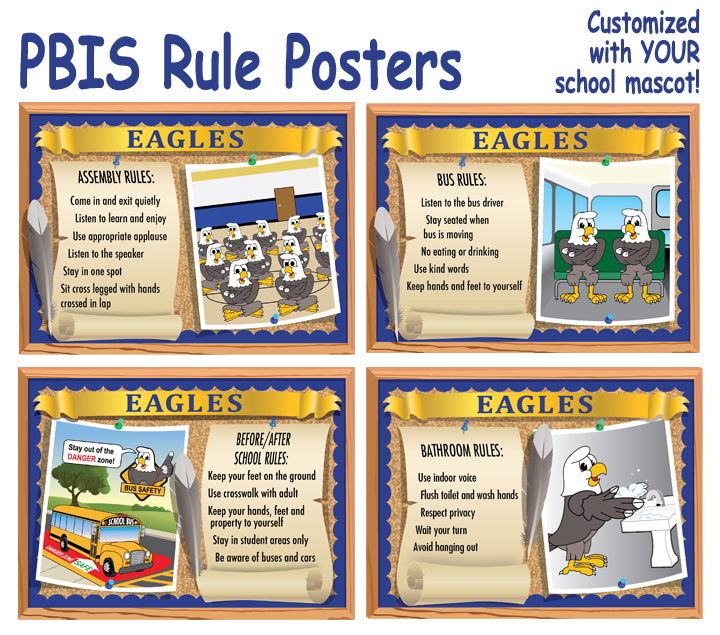 Meet your PBIS posting requirements of posting your rules in at least 8 areas of your school with our rule posters. We customize each poster with the rules, or expectations from your matrix. Go big with a large welcome banner that tells students what it's like to be part of the Phoenix community, have Phoenix friends, do things the Phoenix way, and why every day is a GREAT day to be a Phoenix! Post a large banner that features your PBIS theme prominently. Go big with your PBIS theme with a 50 foot by 10 foot jumbo banner. Get a set of 26 hallway street signs to create a strong sense of community within your school. Use some signs to identify different rooms and others to reinforce your PBIS program. These A-Frame signs are easy to customize daily with dry-erase markers to tell everyone about daily activities and welcome guests for special events. 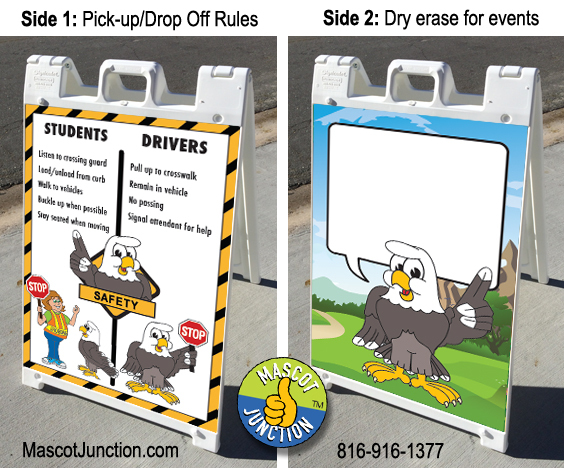 Many school have us print their rules for the pick-up and drop-off areas, so they can put the important safety information on the sidewalk, close to drivers, and right in the middle of sidewalks, and pedestrian traffic areas for students. 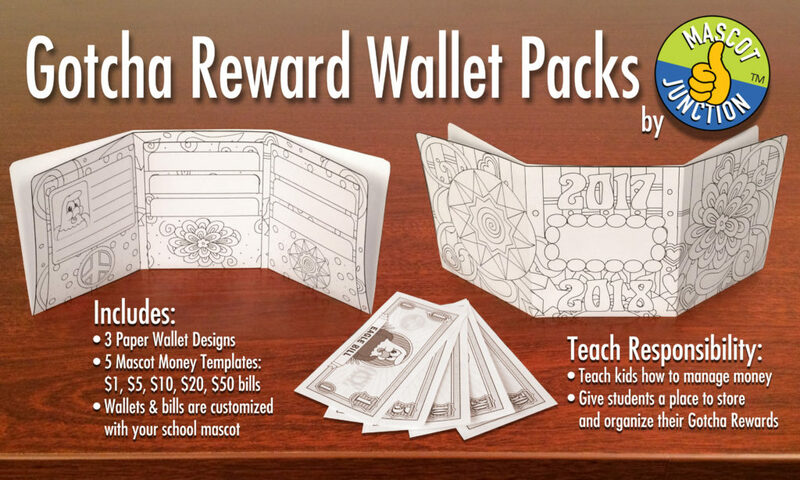 Use this Gotcha Reward Wallet to teach kids how to manage money and be responsible. to share this story, and customize it with a different mascot. 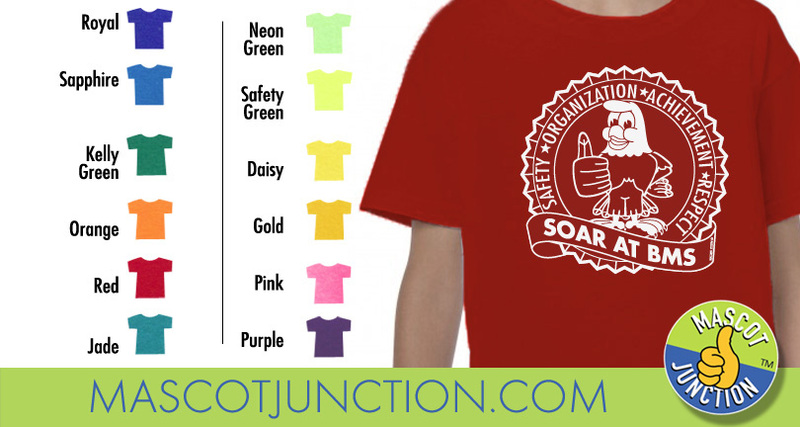 Get t-shirts that integrate your PBIS theme with your mascot. Some schools get a different color t-shirt for each grade. We custom design, print and deliver t-shirt right to your doorstep at very competitive prices. 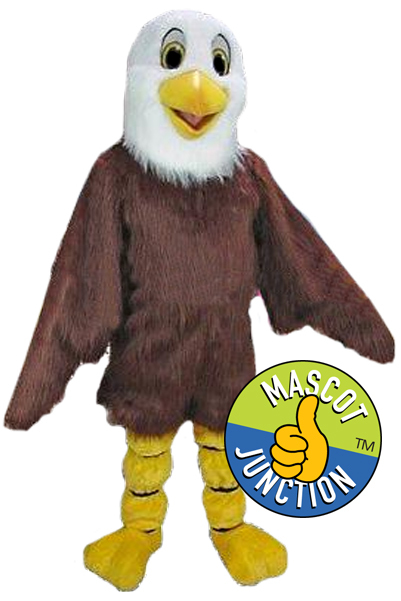 Call 816-916-1377 for a quote, or e-mail info@mascotjunction.com.